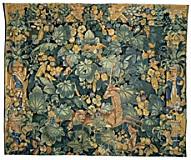 An early 17th Century-Style verdure tapestry, such as those woven in Brussels. 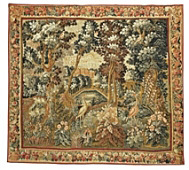 An early 18th Century tapestry from the Flanders Workshops. A stage is resting in a clearing, with a distant village in the background. A beautiful piece. Silk Screened. 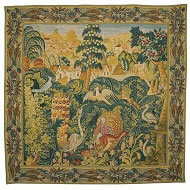 Inspired from tapestries woven at the beginning of the 18th Century at the Royal Beauvais Manufactory. 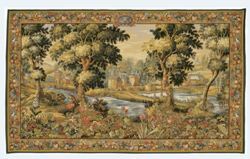 This important weaving centre was established circa 1664, and produced a steady output of "Verdure" tapestries, mainly for country residences. This tapestry is hung with hanging batterns with pins. More information is available. Woven in France. 100% cotton. 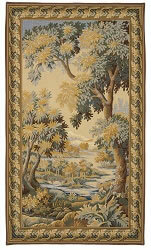 From an 18th Century Beauvais verdure tapestry. Beauvais tapestries often featured rich borders and decorative medallions. 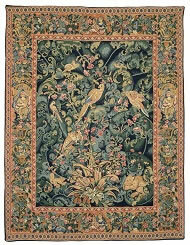 A fine example of the "Verdure" tapestry, many of which were woven in such towns as Tournai and Audenarde in Flanders.